The eighteenth annual meeting of the Brookline Historical Society was held in the Edward Devotion House, Brookline, on January 30, 1919, at 8 p. m., President Charles H. Stearns in the chair. Edwin B. Cox was a lawyer. Coming from Boston in 1893 he had since lived on Buckminster Road. Charles A. Williams was born in Brookline in 1851, a son of Moses B. Williams, who in his day took an active interest in Brookline affairs, and was at one time one of the School Committee. Charles was a lawyer and associated in business with his brother Moses: he was for a number of years counsel for the town. A very quiet, modest man of the strictest integrity, fond of his home. He is a great loss to our town. Mrs. Emma L. Palmer was the wife of Frederick E. Palmer, the florist living on Newton Street and having his place of business in Harvard Square. Mrs. Palmer came with her husband to Brookline in 1900. Charles M. Baker was a native of Boston, coming to Brookline in 1887 and settling in Longwood, where he had a beautiful home. He was a banker of the firm of Chase & Barstow and had been a successful business man. He was the husband of our efficient member of the School Board. Frederic Henry Hedge was born in 1831 in West Cambridge, now Arlington, where his father was preaching. He was in the Harvard College Class of 1851, graduating with the late Dr. Samuel Green, formerly mayor of Boston. These two men for several years had been the only representatives of their c1ass living, and it is an interesting fact that they died within a few days of each other. Mr. Hedge, through his family, had a life-long connection with Brookline, his mother being a daughter of Dr. John Pierce, who was the Brookline minister for over fifty years, and his father was a successor in the pulpit of Dr. Pierce. Mr. Hedge had spent most of his years as a librarian, first in Providence and later in Lawrence. Coming to Brookline in 1902, he soon after joined our society, and had been quite active in it, attending our meetings until his health forbade. He was a great reader, and student and a devoted botanist. He was an authority on books and had probably the largest library in Brookline. He was in his eighty-eighth year. Henry T. Richardson was a lawyer, residing in Brookline since 1900, and at the time of his death living on Cypress Place. He stood high in his profession and was at one time president of the Boston Society of Lawyers. He had also been the president of the Men's Club of the Harvard Church Society. January 30, 1918. 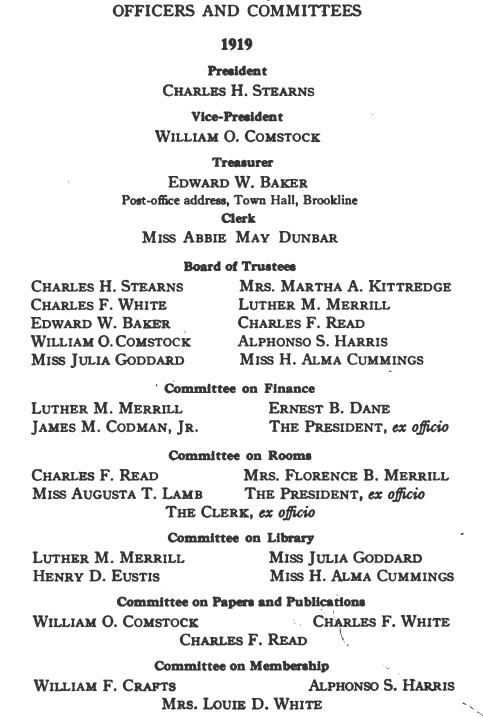 The annual meeting, at which officers were chosen, and the president read a paper in which he incorporated most of an address delivered at the two hundredth anniversary of the First Parish in Brookline in November, 1917. February 27. The treasurer, Edward W. Baker, read some letters written to a Brookline mother by her daughter who was in the Red Cross service in France; also letters from a physician associated with the Massachusetts General Hospital Unit, describing a visit to the front-line trenches. These were timely and very interesting. .
April 24. Dr. Eric P. Stone of Brookline read a paper on a summer at the Grenfell Mission, giving an interesting sketch of his and his wife's experiences on the coast of Labrador, and showing many photographs which he took during his trip. May 29. Walter Kendall Watkins of Malden spoke on "Boston Common in the Past." Mr. Watkins is an authority on ancient lore, and he told much of what was new to us regarding the changes in the boundaries of the old Common, showing maps and old pictures. The original field was considerably larger than the present one. November 20. Mr. Read read a paper on Brookline Village from 1865 to 1917, written by Martin Kingman, who for many years kept a general dry goods store in the building next to that now occupied by William D. Paine, but which for a long time had been the grocery store of J. M. Seamans. This paper was full of reminiscences of the occupants of the various stores and shops, nearly all, if not all, of whom have died. Following the illustrations of old Brookline Village by Mr. Baker, they brought the old buildings and occupants vividly before us older people. It is interesting with the great growth of Coolidge Comer, with its multiplicity of stores, to remember that in 1865, the beginning of Mr. Kingman's paper, the only place of business at the Comer was the country store of Coolidge and Brother, the predecessors of the big S. S. Pierce establishment. Brookline Vil.1age was the business center of the town, though located 80 near to what was then Roxbury, now Boston. Beacon Street at that date was a narrow country road, with very few buildings along its way, and farming was about the only occupation of the whole northerly part of the town. The old Coolidge store, with its pump and watering trough in front and the hay scales just beyond, was a prominent object on the road leading to Newton Center, and was portrayed in one of Mr. Baker's pictures. Mr. Baker's series of views on Beacon Street before its widening vividly show the conditions along the street and its open and isolated locations. Alexander Pomeroy Sears, a wholesale dealer in groceries, a merchant of Boston, eighty-three years of age. Mr. Sears was a nephew and partner of Joshua Sears, who died many years ago leaving a large fortune to his son Montgomery. Mr. A. P. Sears was a quiet gentleman of the old school, very fond of music, and quite proficient as an organist. John Koch was of German parentage, coming to this country some fifty or more years ago. He was a cabinetmaker by trade, but latterly he, with his sons, organized the American Screen Company, making window and door mosquito screens. He, in his day, was quite an athlete and a firm believer in long walks to promote health. On a Thanksgiving day when he was over eighty years of age, he walked from his home on Thorndike Street to Dedham, going around the Court House, and home, a nearly twenty-mile walk. He devised and manufactured a number of machines intended to strengthen the various members of the body; these he grouped together in a room at the comer of Walnut and High Streets, where he exhibited and explained their uses. They were very ingenious, though too elaborate and expensive for general use. Thomas Hartigan, born in Ireland. Coming to this country as a gardener, he had worked on several estates here, among them that of Moses Williams. In his later years he was the janitor of the Prof. Runkle School, where he was best known and where he had a chance to display his skill in raising flowers, both in the schoolyard and in the building. It was one of the pleasant sights of the town in summer time to ride by the school and see his display. Mr. Hartigan took pride in his work and was fond of showing the schoolhouse, which was kept immaculately clean. He was a typical Irish gentleman. Mr. Edward Hale was a Unitarian minister preaching at Chestnut Hill and, of a singularly gentle and lovable nature, he endeared himself to all who knew him. Frederic Hinckley, a member of the firm of Hinckley and Woods, Insurance. In his younger days he had been a sea captain commanding some of the old-time sailing ships. He was a man of great integrity and stood high in the business world. He lived to be eighty-five years of age. Lyman J. Clark will be remembered as a speaker at the old-time town-meetings, very persistent in what he thought was right, and he will be pleasantly remembered. Mrs. Caroline R. Sabine, wife of Dr. George K. Sabine, was an indefatigable worker for the soldiers in the late war. One of her sons, an officer in the army, recently died, a victim of pneumonia. Zabdiel A. Willard was the son of Simon Willard, the celebrated c1ockmaker, and himself a scientist and writer. He lived to the good old age of ninety-two. '. Henry K. Paine, a member of the former firm of Paine Brothers, plumbers and tin workers. He was born in Eastham on the Cape, was a soldier in the Civil War, a member of the G. A. R., always appearing in their ranks on Memorial Day and other occasions of parade. Eighty-one years. Thomas Aspinwall, son of William Aspinwall, who was so prominent in town affairs fifty years ago. The name of Aspinwall has always been prominent in the town since its very beginning, and Mr. Thomas made a name for himself, as a member of the firm of Aspinwall & Lincoln, in laying out and directing the widening of Beacon Street thirty years ago. He died at the age of sixty-five. Dr. Henry M. Cutts was prominent as a physician and was much interested in the work of promoting health among the school children. I. Lewis Brackett, formerly in the wool business, but, stricken with blindness, had for many years lived a quiet home life. He lived to be ninety years of age. Mrs. Mary W. Chandler, the wife of Alfred P. Chandler, a brother of Charles Lyon Chandler, a lieutenant in the Civil War, and whose name is at the head of our local G. A. R. Post. Mrs. Chandler was the mother of five sons who have all been in their country's service in the recent war - three of them overseas. Mrs. Chandler was a granddaughter of Dr. John Peirce and a daughter of Henry V. Poor, who lived to be over ninety years of age. Mrs. Mary S. Webster was the last of a large family, children of Robert Sharp Davis, a well-known publisher of school books in his day and a descendant of a prominent Brookline family. Colonel Charles R. Codman was an officer of the Civil War, a native of Boston, and lived for many years in Barnstable. He came to Brookline a few years ago, his home being on High Street. He was a brother of James M. Codman, Sr., who died in recent years. Colonel Codman was eighty-nine years old at his death. Henry H. Robinson had lived a quiet life and was not much known in town affairs. He was an artist of considerable proficiency and left quite a gallery of paintings. He lived to be seventy-eight years of age. We are and have been living in such strenuous times and dealing with such momentous events, it may be interesting to look back a hundred years and read what was happening then to occupy the minds of our forbears; so in the town records, it is written that "at a town-meeting held this day (November 2, 1818) a committee was appointed to report on the expediency of permitting stoves to be erected in the meeting house, and report this day ·y.reek at three o'clock p.m. the probable expense. "Ebeneezer Heath, John Robinson, and Capt. Isaac Cook be the committee to make the necessary inquiries on the subject." Here were three of the solid men of the town on this momentous question: Mr. Heath, a farmer living in the house still standing on Heath Street; Mr. Robinson, a tanner, whose house still stands on Fairbanks Street, corner of Washington Street; and Captain Cook, a brewer, whose house also stands on Cottage Street. November 8, at an adjournment: "Voted, the report of the committee be accepted, and that permission be granted to have the stoves erected in the meeting hoUse agreeable to the report of the committee. Voted, there be a committee of five, viz. : Deacon John Robinson, Mr. N. Murdock, Capt.ain Cook, James Leeds, and O. White, to offer the subscription to every family who worship at this meeting house in the winter se3SQn. Voted, that if the stoves are erected, they be supported and taken care of at the expense of the town. The stoves were erected, and probably were the same in use as I remember the church forty years later. Another interesting event fifty years ago: In town-meeting, May 5,1868: "Voted, that the Selectmen be authorized to purchase on behalf of the town about twenty acres of land, more or less, on the northerly side of Harvard Street at a price not exceeding thirteen hundred dollars per acre." This was a part of the Babcock farm, and is the site of the Devotion Schoolhouses, and this, our Edward Devotion House. This vote was withdrawn, and it was not until 1891 that about six acres, a portion of the above larger tract, was bought of Nahum Smith and one of the schoolhouses was shortly after begun. The amount of money appropriated for town expenses in 1818 was $3,500. For 1918, $1,889,723.23. As showing the change of sentiment regarding birds, a vote was passed in 1818 that "the Town Treasurer be empowered to pay twenty-five cents for the head of every crow which he is satisfied has been killed within the limits of the town. Also voted that the State law for the protection of certain birds be so far remitted as to allow a man at all times to kill robins on his own land." Evidently the Audubon Society had no standing at that time. Coming to our own time and generation, what a wonderful year it has been, and how petty the subject of stoves or even of schoolhouses seems, compared with the stirring events we have been through. Living in their midst, we cannot appreciate their importance; but to the citizen living fifty or a hundred years hence, what a wonderful history the war and its possible results will make. Our society has had its usual success; our meetings have not been crowded, but the faithful few have seemed to be interested in the papers and topics presented. It was thought by the directors of the society that it would be well this season to have our meetings bi-monthly; so no meetings have been held in October and December, neither will there be any in February and April. No public utterance nowadays seems complete without some allusion to the war so recently finished. At our meeting last January the result seemed very doubtful; the Germans apparently were masters of the situation and their drive soon after in March carried dismay to those who could not know the actual condition of affairs so far away. But in July the tide turned, thanks largely to our American boys, and we all know the result. Let U8 trust and believe that the Powers now at Paris may evolve a lasting peace - a league of nations that will be governed by Law and Order, and that arbitration rather than fighting govern all disputes. Our society was represented in the procession formed for the glorification of victory. Our town has been largely represented in the army and navy, 1,841 young men, either enlisted or drafted, being enrolled in the honor records. Our population is estimated at 37,000, so the above number is about one twentieth, or five percent, of the total. Surely a fine record! There have been but few changes in the real estate of the town on account of the high price of materials and labor, together with the prohibition of the Government from beginning new work except that absolutely essential. Scarcely any building has been begun and the consequence has been that but four new houses have been built during the year. One old landmark has been destroyed -the Beck House, so known, on Davis Avenue having been taken down. This house, which in its day had been a fine old mansion, was built about 1833 on what was then known as Washington Place, by Mr. Isaac Thayer. He was a brother of Seth T. Thayer, who also built near the corner of Washington Place and Washington Street. This latter house, or a part of it, is still standing and occupied by Nelson Thompson, upholsterer. Mr. Isaac Thayer did not live in his house many years and it was sold to James Patten. The young Pattens and children of Seth T. Thayer were a welcome addition to the younger set from 1845 to 1860. Mr. Thayer's numerous family, with one exception, are all gone; also, I think, the Patten family. These two houses and that of Captain Woodward, just beyond the house that has been taken down, occupied all the land on the northerly side of what was called Washington Place, now Davis Avenue. Mr. Seth Thayer had eight children; the Pattens, four or five; and the Woodwards, two; and they made a merry party of themselves. Mr. Patten died about 1855 and the place was sold to Mr. Frederick Beck, who died a few years ago. The garden originally went through to Washington Street. The Woodward house was moved to the southerly side of Davis Avenue, further west. All the land on the southerly side of Washington Place was a part of the Benjamin Davis farm. Mr. Davis' house was on the comer of the Place, fronting on Washington Street. A picture of this quaint old house formed the heading of a calendar gotten up by the Brookline Trust Company three years ago. On the opposite comer, in his front yard, Mr. Seth T. Thayer erected a wooden building about 1845, the lower part of which he occupied as a store, and the upper story was used as a hall for dancing classes, singing schools, clubroom, and for political gatherings. This afterwards came into the possession of James Seamans, where for many years he kept a grocery store. Later a large brick building was erected in its place, where to-day William D. Paine has his periodical and stationery establishment. The old wooden building was sold to James Driscoll, who moved it to Cameron Street, where it to-day does service as a tenement house. I desire to call attention to the condition of the milestone on the grounds of the Harvard Church. The paint on the letters and figures on the stone is almost entirely worn off so that one can scarcely read what it says. I would suggest that the matter be put into the hands of a committee with full powers to repair the stone. Historical Sketches of Brookline, Mass., by Miss Harriet F. Wood. 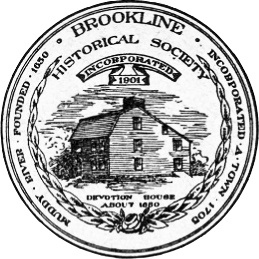 A series of articles written under the title of "Brookline As It Was," and published in the "Brookline Transcript" during the years 1871-2. Marked H.F.W. Address at the Opening of the Town Hall in Brookline on Tuesday, 14 October, 1845, and Historical Discourses by Rev. John Pierce, D.D. Marked Dr. Pierce. The Brookline Firat Parish in My Time, 1873-1895, by Rev. Howard N. Brown, D.O. Marked H. N. B. First Parish Church Records of Baptisms, Marriages, and Deaths, for 100 Years, Brookline Historical Publication Society. Marked F. P. C. R.
Muddy River and Brookline Records 1634-1838. Marked M. R. R.
Records in the Office of the Town' Clerk. Marked B. R.
Records from Joaeph D. Guttenon, undertaker. Marked J. D. G.
Report of the Cemetery Committee of the Town of Brookline for 1842. Written, not printed, in the Brookline Public Library. Marked R. C. C.
Information obtained from individuals is 10 stated. Unless lot or tomb is given, place of burial is unknown.